The recipe makes 3 jars about this size (about 175 ml each). Good stuff. I went nuts again. Cashews to be precise. It was time to finally get rid of the bag of the little darlings I purchased last week – before I ate them all. identifiable stages. This is the whole nuts (of course). If you can get pieces cheaper do it. No need for whole nuts. 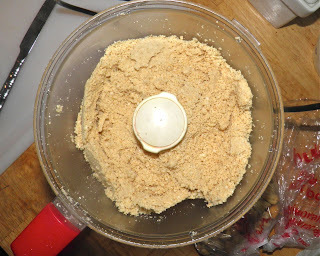 My modus operandi was to be the food processor, and my goal was cashew butter. What I discovered was that cashews would not “go gentle into that good night” as easily as peanuts (apologies to Dylan Thomas). At least that was my experience. I had made peanut butter several days ago (see post above) and had purchased cashews at the same time with the same intent. The peanut butter turned out perfectly. It tastes amazingly good. In fact, I cooked with it in yesterday's post. 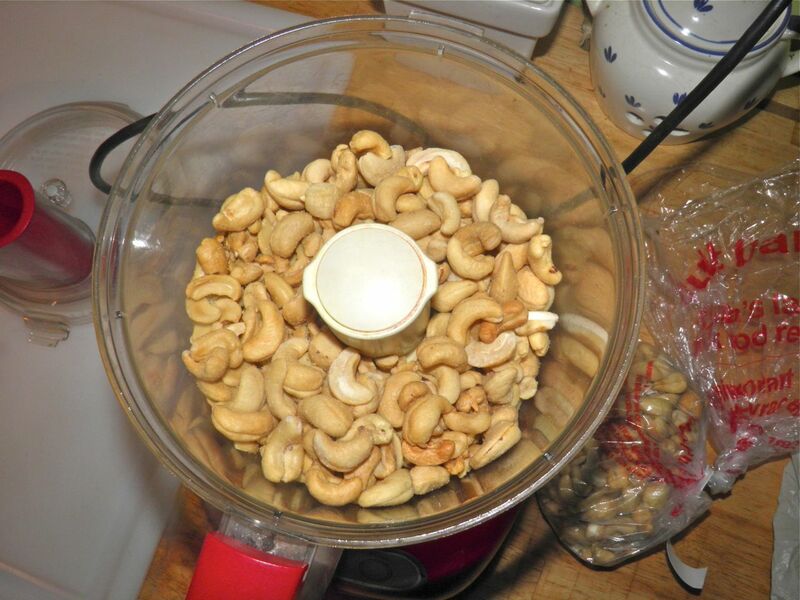 I figured if the peanut butter was as easy as it was I could do the same with the cashews – throw in the processor, grind and put in a jar. That’s all it took to make peanut butter. Well, that wasn’t quite the case. This is still unbelievably easy but I was surprised that I had to add vegetable oil to the mixture. The fat content of cashews and peanuts differ. It's safe to say all all other nuts differ from each other in that regard as well. This is the rough chop stage. I chose this time to make a crunchy nut butter as opposed to the smooth I did for the peanuts. You don’t have to do so if you don’t want. The nuts I purchased were roasted and lightly salted, not dry roasted. I’m assuming that dry roasted would require a little more vegetable oil than regular, but that’s pure conjecture. A word on purchasing nuts: They’re not cheap, so shop around. In Nova scotia I find that they are cheaper (per 100g) at the grocery stores than at the bulk food store, by a whopping 77¢. Recently both our major chains have put bulk bins (back) in their stores. Go there to buy them. You’ll save some dough. 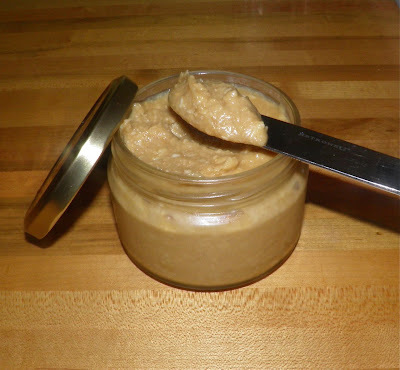 As with all homemade nut butters, you should refrigerate after making. That is because homemade doesn’t have any of the preservatives of commercially produced. It also firms up more after it cools. Homemade nut butters are so easy to make and a great way to add these nutrient-rich foods into our diet. Too few of us eat nuts on a regular basis. As always, ensure that whoever is eating this has no allergy to cashews. Anaphylactic shock is a nasty, nasty thing, and can be fatal in some cases. If you know you're not going to kill anyone homemade nut butters make wonderful, thoughtful and healthy gifts. You can flavour them with pretty much anything. Think of the combinations... I have half an eye on making homemade Nutella some time soon. This butter has not yet made its final journey onto a piece of toast. But I can attest that it’s very tasty by the spoonful! stage would be a damp mass. Cashews need some help. Place 400 g of the cashews in a food processor. Chop into fine pieces. 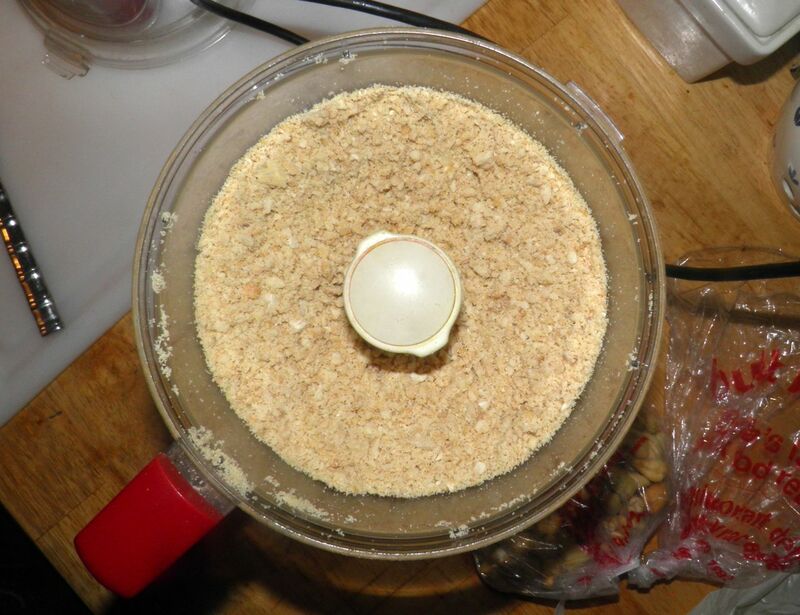 Stop the motor and scrape the ground nuts down into the bowl. If a mass is starting to form, break it up. 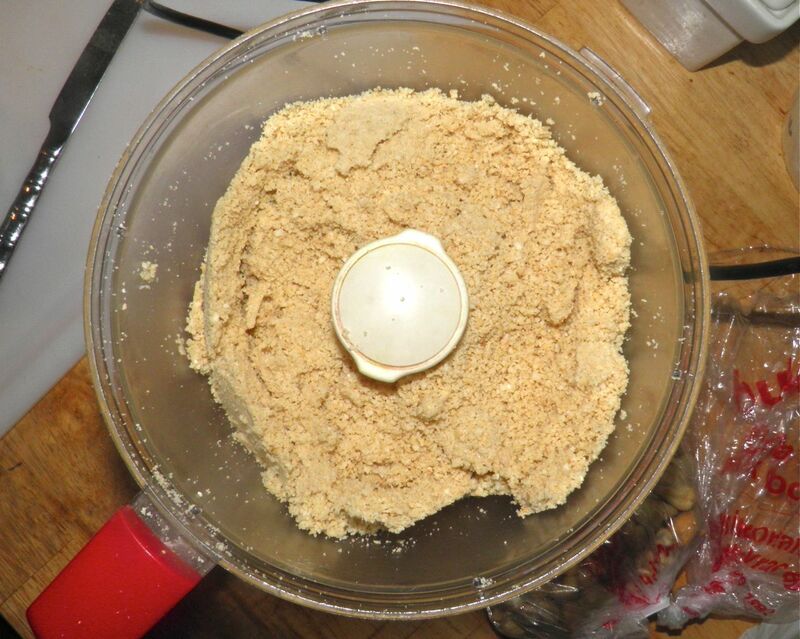 Close the processor and chop more until you get cashew “flour” – fine ground cashews. Scrape down the sides occasionally. Add the honey and process. Keep the motor running. The cashews will continue to break down. As it processes stop periodically and scrape down the sides. Check to make sure it isn’t forming a solid mass at the same time. Process until the nuts are quite smooth. This is after the honey and a little oil has been added. Depending on the moisture content of your nuts you will almost certainly need to add a little vegetable oil. You have to have a mass in the processor that is stiff, yet moves as a purée. 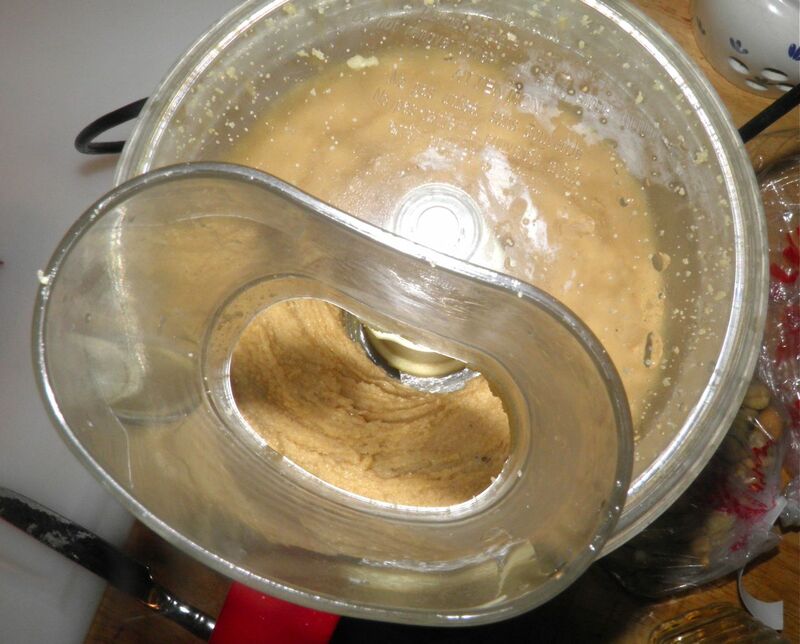 Slowly add vegetable oil as the motor runs until you get a mixture that barely moves freely in the bowl. Do this at about 1 tablespoon at a time. Too much vegetable oil will give you a very loose butter. Check for salt. Adjust if desired and process more. Next add the remaining 100g of cashews. Pulse the mixture until the cashews are roughly chopped. Place in a jar or small jars.